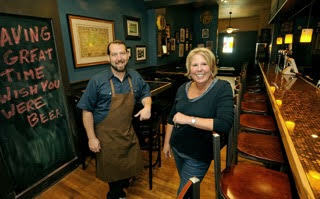 Chapman’s Food and Spirits is the “Chef Driven – American Fare build your own experience restaurant concept derived from the friendship and business partnership between Kitty Hopkins and Chef Peter Hamm. Peter Hamm’s culinary education began early in middle school and throughout high school. Peter studied under many culinary professionals to provide solid foundation to develop his creative skills. Graduating high school early, before his classmates had earned their high school diplomas Peter earned his culinary degree and jetted off to an internship in Edinburg, Scotland. With entry into the International Food Competition in Malta, Peter won first place to secure a position with Restaurant 36 a world class old- European restaurant. Eventually returning to the states, Peter spent several years adding experience and perfecting his talents working in high volume resort establishments throughout the east coast. Peter’s experience as a Executive Chef include experience more in depth than most Executive Chefs - Peter has extensive experience with new restaurant start up concepts. Peter’s first startup venture was with the opening of dual concepts Rockwell’s Kitchen and Tap and the Republic in Grand Rapids, Michigan. Responsible for menu development, menu sell price, kitchen design, execution, systems and procedures to develop service including hiring and training full staff and not to mention be profitable. By end of the first year after opening with 800+ covers sold daily, the concept was voted Best New Restaurant in Grand Rapids and exceeded performance and break even projections. Peter’s success with Rockwell’s and Republic became known to many professionals within the industry and Peter’s name was offered to many investor(s) looking for a detail oriented superstar- eventually reaching the investors who opened Southern Prime Steakhouse in 2011—Peter came to Southern Pines. After the successful opening of Southern Prime, Peter took his talents to Ross Resorts before heading to the Bahamas to again develop a new start up concept for a multi million dollar resort venture. After enjoying the success in the Bahamas after yet another successful opening, Peter decided it was time come state side and together with Kitty worked to develop the casual concept we know as Chapman’s Food and Spirits. A familiar face in Southern Pines, Kitty is a longtime local resident of Moore County. Kitty began her foodservice sales career as a bus girl at Foxfire CC in 1979 under strict hospitality focused professionals when she was 15. While working in several hotels and resort locations including The Pinecrest Inn and The Carolina Pinehurst Resort Kitty became hospitality trained and hospitality focused. Opportunity to join the wait staff at Vito’s Pizzeria in 1982 began decades of part-time employment history with them . Here, Kitty earned an excellent reputation among guests, eventually leading her to a management position in the high volume breakfast and lunch restaurant, The Villager Deli in Pinehurst. Although Kitty continued work in the foodservice industry for many, many years, Kitty continued to add experience and responsibilities working in other service and management positions. By 2003 experienced in human resource, payroll, accounting and financial analysis Kitty had extensive experience and was hired by Sysco Foodservice in May 2006 as outside sales consultant. Kitty worked with independent operators, chefs and managers to achieve profitable results. Throughout a successful 10 year history as Territory Manager Kitty was a top sales performer and 2013 Sysco Associate of the Year before leaving in 2016 to develop and operate Chapman’s Food and Spirits with Pete Hamm. Together Peter and Kitty have the experience, passion and drive to manage the success of Chapman’s Food and Spirits and be a vital part of the community. 2015 Remodel & Opening of Chapman's!